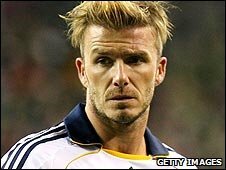 England star David Beckham says he is proud of LA Galaxy despite their defeat in the MLS Cup final on penalties. "It's always tough losing, but we can be proud of where we've come to," said Beckham, who scored his spot-kick. Meanwhile, MLS commissioner Don Garber says Beckham has been given the option of buying the league's 20th team. MLS currently has 15 teams with Philadelphia joining in 2010 followed by Portland and Vancouver in 2011, while Montreal lead the chase to become the league's 19th team. Garber revealed: "David has the option for our 20th team and that option can't be exercised until after 2011 or after he stops playing. So we've got some time to figure that one out." "We all want to win titles and personally I'd love to be successful," added Beckham. "But I think we have been successful this year without winning tonight, we have quietened a few people along the way which is always nice but we couldn't finish it off. "I wouldn't say it's tougher to lose on penalties but it's Russian roulette, that's just the way it is. It's not a nice way to lose. "The people that step up are brave enough to step up and if you score, great and if you miss it's hard to take, but it just wasn't our night." Beckham was impeded by an ankle injury he had picked up prior to Sunday's showpiece final and he limped badly throughout the 30 minutes of extra-time. "I had three injections but they wore off after 50 minutes," said Beckham. "Bone bruising is like that, one of those injuries that doesn't really go away until you rest it and take some time off, so I will do that now. "It is the end of the season and I have to just try and rest it and get ready. I'll have rehabilitation because it has been like this for a few weeks." "Of course, I said I would be back, hopefully after the World Cup and that's not going to change," he said.